Home » Our Doctors » Huey Tran, O.D. Dr. Huey Tran is the founder and CEO of TRANSVISION EYE CARE. He received his degree as a Doctor of Optometry from the University of Alabama at Birmingham School of Optometry (UABSO). 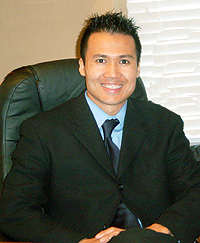 Previously, Dr. Huey Tran had graduated from Virginia Tech with a Bachelor of Science degree in Biology and Chemistry. Before opening TRANSVISION EYE CARE, Dr. Huey Tran received his optometric training at Trussville Vision Care, Tuscaloosa Veteran Administration Hospital and UABSO Eye Care. Dr. Huey Tran specializes in the treatments of eye disease and vision disorders with emphasis on glaucoma, corneal disease, eye allergies, and dry eyes. Dr. Huey Tran also enjoys fitting contact lenses for everyone, especially those hard-to-fit patients. Professionally, Dr. Huey Tran maintains membership in the American Optometric Association and the Texas Optometric Association. Dr. Huey Tran enjoys spending time with family, piano, culinary arts, exercise and travel.